Only One Left Be Quick! 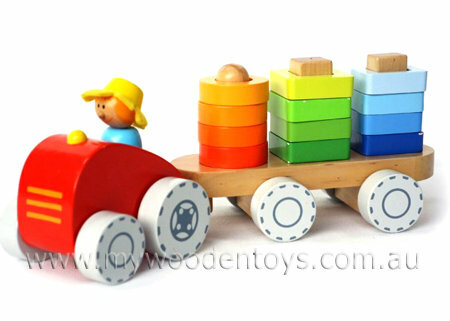 Farm Tractor Stacking Shapes is a lovely colourful stacking toy combined with a push a long farm cart with trailer. This beautifully made toy contains 12 removable stacking pieces placed onto 3 upright columns on a wooden cart. All this is pulled by a tractor driven by a farmer. This multi-purpose toy can be used as a stacking game and as a push around cart . A great physical toy and a lovely way to practice those co-ordination skills. We particularly like the different shades of stacking rings and squares for extra sorting challenges. Material: Wood and Child-safe paint. We like this because: "Lovely bright fun toy with multiple uses." I received my order today. Thank-you. Everything is as I expected.Great quality, great prices and customer service excellent!